The combination of different phases of water—solid ice, liquid water, and water vapor—would require some effort to achieve experimentally. For instance, if you wanted to place ice next to vapor, you would have to continuously chill the water to maintain the solid phase while heating it to maintain the gas phase. For condensed matter physicists, this ability to create different conditions in the same system is desirable because interesting phenomena and properties often emerge at the interfaces between two phases. Of current interest is the conditions under which Majorana fermions might appear near these boundaries. Majorana fermions are particle-like excitations called quasiparticles that emerge as a result of the fractionalization (splitting) of individual electrons into two halves. In other words, an electron becomes an entangled (linked) pair of two Majorana quasiparticles, with the link persisting regardless of the distance between them. Scientists hope to use Majorana fermions that are physically separated in a material to reliably store information in the form of qubits, the building blocks of quantum computers. The exotic properties of Majoranas—including their high insensitivity to electromagnetic fields and other environmental "noise"—make them ideal candidates for carrying information over long distances without loss. However, to date, Majorana fermions have only been realized in materials at extreme conditions, including at frigid temperatures close to absolute zero (−459 degrees Fahrenheit) and under high magnetic fields. And though they are "topologically" protected from local atomic impurities, disorder, and defects that are present in all materials (i.e., their spatial properties remain the same even if the material is bent, twisted, stretched, or otherwise distorted), they do not survive under strong perturbations. In addition, the range of temperatures over which they can operate is very narrow. For these reasons, Majorana fermions are not yet ready for practical technological application. 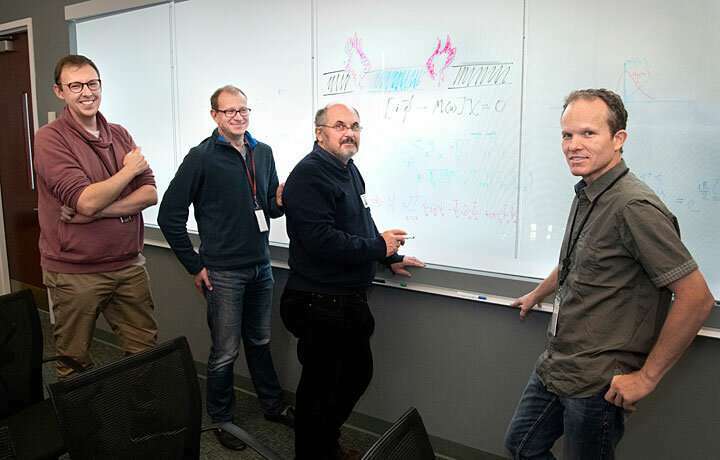 Now, a team of physicists led by the U.S. Department of Energy's (DOE) Brookhaven National Laboratory and including collaborators from China, Germany, and the Netherlands has proposed a novel theoretical method for producing more robust Majorana fermions. According to their calculations, as described in a paper published on Jan. 15 in Physical Review Letters, these Majoranas emerge at higher temperatures (by many orders of magnitude) and are largely unaffected by disorder and noise. Even though they are not topologically protected, they can persist if the perturbations change slowly from one point to another in space. "Our numerical and analytical calculations provide evidence that Majorana fermions exist in the boundaries of magnetic materials with different magnetic phases, or directions of electron spins, positioned next to one other," said co-author Alexei Tsvelik, senior scientist and leader of the Condensed Matter Theory Group in Brookhaven Lab's Condensed Matter Physics and Materials Science (CMPMS) Department. "We also determined the number of Majorana fermions you should expect to get if you combine certain magnetic phases." For their theoretical study, the scientists focused on magnetic materials called spin ladders, which are crystals formed of atoms with a three-dimensional (3-D) structure subdivided into pairs of chains that look like ladders. Though the scientists have been studying the properties of spin ladder systems for many years and expected that they would produce Majorana fermions, they did not know how many. To perform their calculations, they applied the mathematical framework of quantum field theory for describing the fundamental physics of elementary particles, and a numerical method (density-matrix renormalization group) for simulating quantum systems whose electrons behave in a strongly correlated way. "We were surprised to learn that for certain configurations of magnetic phases we can generate more than one Majorana fermion at each boundary," said co-author and CMPMS Department Chair Robert Konik. For Majorana fermions to be practically useful in quantum computing, they need to be generated in large numbers. Computing experts believe that the minimum threshold at which quantum computers will be able to solve problems that classical computers cannot is 100 qubits. The Majorana fermions also have to be moveable in such a way that they can become entangled. The team plans to follow up their theoretical study with experiments using engineered systems such as quantum dots (nanosized semiconducting particles) or trapped (confined) ions. Compared to the properties of real materials, those of engineered ones can be more easily tuned and manipulated to introduce the different phase boundaries where Majorana fermions may emerge. "What the next generation of quantum computers will be made of is unclear right now," said Konik. "We're trying to find better alternatives to the low-temperature superconductors of the current generation, similar to how silicon replaced germanium in transistors. We're in such early stages that we need to explore every possibility available."